Thirty years ago when Dale and I decided to return to NY to get married (we were living on the West Coast at the time), the very first “joint” we had to visit was his favorite hang, PJ Clarke’s. Back then, Frank Conefrey manned the bar. Years later, a new bartender took the helm and Dale’s love affair with Clarke’s only grew stronger. Doug Quinn had a commanding presence. 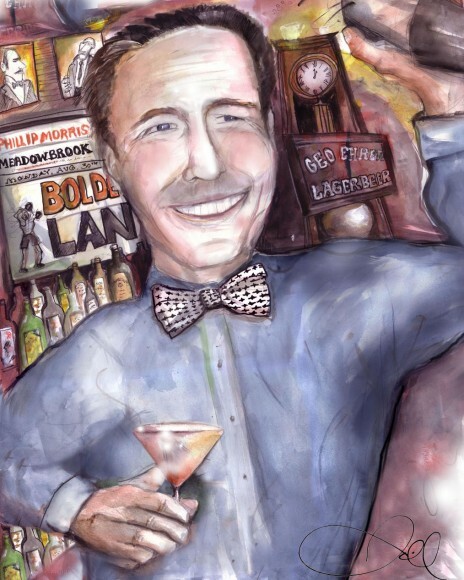 Dale marveled at his agility and speed at working a continually over crowded bar –making drinks while also greeting everyone, keeping the regulars happy, and maintaining that code of conduct that Dale holds sacred: friendliness, attentiveness, and treating customers with the utmost respect and dignity. That is Doug in a nutshell- and he takes it a step further in the way he skillfully introduces guests to one other, insuring everyone has a good time. The recent incident at Clarke’s, in which Doug interceded when a hostile customer threatened some female guests at the bar, is a perfect example of the integrity he brings to the bar. Sadly the manager sided with the offending customer and when Doug took a stand, he told Doug to take a walk. Well, look out New York because one of our best bartenders will undoubtedly reappear before too long at a new joint we can all call home. Here is a story that Doug once told when I asked him for a favorite tale for my book. It so perfectly illustrates who he is and why he is so loved by the community. “One cold, damp, winter night, one of my semi-regulars, who looks remarkably like Grandpa Munster, managed to survive the evening until about 4:00 AM. I walked him out, put him in a cab and bid him a safe trip home. I gave him my business card and told him if he ever needed anything, to give me a call. I returned to the bar, and among the napkins, matchbooks, and other discarded junk you find on the floor in a busy saloon I noticed a bank envelope. I picked it up, looked inside and found one hundred crisp hundred-dollar bills inside; ten grand in cash. Add that to what I made behind the bar that night- would have been a darn good night in any saloon. I started to think about who dropped the ten Gs and immediately thought of Grandpa Munster. He came in the next day, took the cash, gave me a hearty handshake, and bolted. Some might say, the guy should have left a sizable tip- or ANY tip- let’s face it; I could have given myself a ten grand tip by saying there was no envelope. Who wouldn’t consider it? Shake over ice, serve chilled straight up in a chilled cocktail glass.